Covering a span of 54 years, Edward Kunkel Jr. has supported the Bartlett High School athletic department in many different ways and has made numerous contributions as a member of the Bartlett High School community. A 1960 graduate of Bartlett High School, he was the epitome of hard work earning twelve varsity letters in football, baseball, track and basketball. Ed later coached football and golf at Bartlett and, later in life, he became a fixture in the stands both as a fan and radio announcer for Bartlett basketball and football games. Upon graduation from Bartlett High School, Ed entered Nichols College and became the starting quarterback on the football team for the next four years. He continued his affiliation with Nichols by serving as their secondary and backfield coach in football for fourteen years. During this time, the defensive backfield ranked number one in the country in 1973, seventh in 1974, tenth in 1975, and also ranked tenth in the nation for overall passing efficiency in 1975. Ed was inducted into the Nichols College Athletic Hall of Fame for football in 1984. 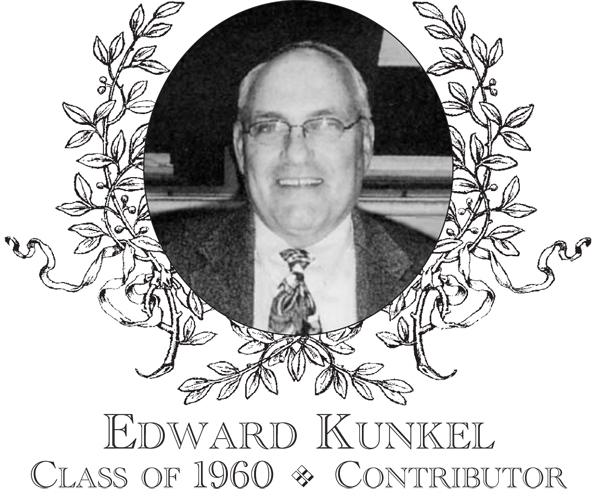 Additionally, in 1965, Edward Kunkel Jr. became the backfield and secondary football coach for Bartlett High School, a position he held through 1970. During that same time frame, he also was the coach of what is considered to be the greatest golf team in BHS history � one that defeated Marlboro High School and ended it�s 36-match, three-year winning streak. His team also qualified for the state tournament that year and finished second amongst all golf teams in the state of Massachusetts. In future years, Ed became the radio voice of the Bartlett High Indians as he offered play-byplay and analysis of Bartlett basketball and football games on the local radio. As business manager for the Webster Public Schools for many years, he continued his invaluable support of the school community and athletic programs and attended many of its events. Throughout the years, Edward Kunkel Jr.�s presence and loyalty to the Bartlett community has remained steadfast and his influence on the athletes he has coached and the community he has served continues to this day as he currently coaches Webster�s youth in its Little League. Ed retired from the Webster Public School system in 2008. He has three children, Julie, Kyle, and Katie, and lives in Dudley with his wife Mary. Ed and Mary have three grandchildren.